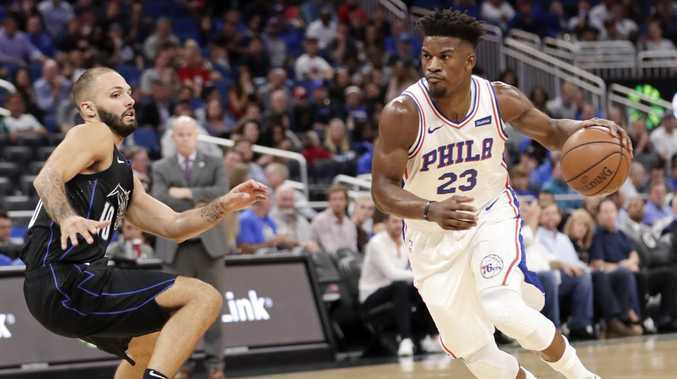 PHILADELPHIA blew a 16-point fourth quarter lead as the Jimmy Butler era began with a disappointing 111-106 defeat against Orlando on Thursday (AEDT). The 76ers were cruising at 92-76 early in the final quarter before the Magic reeled off 21 unanswered points to set up the win. Ben Simmons tied the score at 106-106 with two crunch free throws in the final minute but Terrence Ross hit a huge three-pointer to break the tie with 8.7 seconds on the clock. JJ Redick's game-tying triple was rubbed out because he stepped out in the lead-up to his shot. Sixers coach Brett Brown relegated Markelle Fultz to the bench as Butler joined a starting five of Joel Embiid, Simmons, Redick and Wilson Chandler. The early signs were promising as Embiid and Redick (22 points, six assists) connected on several three-point attempts and Butler (14 points) found ways to score with smart movement off the ball. Simmons was the one who appeared to benefit least from the new arrangement as he took only five shots for the entire game while finishing with a stats line of nine points, six assists and three rebounds. 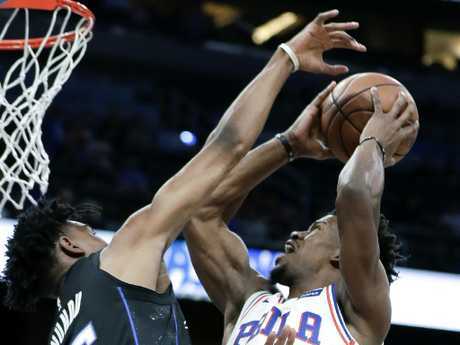 After a strong third quarter it fell apart as Embiid (19 points, 6/20 shooting, 10 assists, 13 rebounds) fell in love with the outside shot and Orlando's Nikola Vucevic (30 points) proved unstoppable. It was up to Chandler to stop the 21-0 run with back-to-back baskets, but he was taken out for crunch time as Brown chose Mike Muscala to play with his starters. Fultz was solid off the bench scoring eight points (4/6 shooting) but it was another sub-par showing on the road from the 76ers, who are 2-7 away from home this season and dropped to 9-7.